In The Mind Of A Designer! A Sneak Peek! So you've put May 2nd in your book, right? :-) From 3:00 - 6:00 we're having a little celebration honoring Mom! OK, and we're kind of celebrating our Romantic Homes article and a few other fantastic news items as well!!! 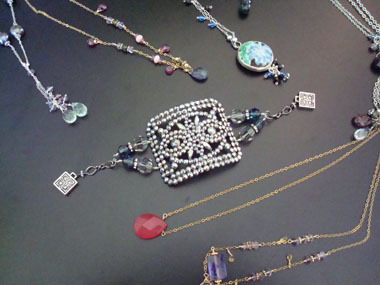 I'm just thrilled to have Cindy Arnet back with her new designs. They are so incredible that I asked her a few questions to explain her creative process. Her answers are so inspiring! Come by and meet her in person at the boutique and celebrate spring with us!!! I am constantly learning new techniques and ways to do things more efficiently. There is definitely a learning curve involved, as my business took off rather quickly (Thanks, Mari). I find inspiration in everyday things and am obsessed with colors IE: what would look good with what? Just when I think I can't do anything different, a new idea pops into my head and I must explore! You always seem so calm and happy yet I know this has been a rough year for you. How has your art intertwined with your life? Well, creatively, I was at a standstill. Yet, somehow I knew that when I was ready, I would need to jump right back in and get back to business. Creating something beautiful is very uplifting to me. Resuming my jewelry making signaled a return to normalcy for both myself and my family. yet I can see you being in boutiques all over the country. What is your future vision for "Sienna Grace"? I would love to expand Sienna Grace's presence to other upscale stores. Ideally, the ones I will seek out are those that have a real appreciation for handcrafted one of a kind items. Each of my pieces is like one of my 'kids' ! Can you tell me a little bit about the materials you use? I have used a variety of materials in the two different collections I have designed. The Ming pottery shards are the most unique as they are one of a kind. After the cultural revolution in China that spanned from 1959-1961, many Chinese artifacts were destroyed. These shards were unearthed from an archaeological dig of an old porcelain factory that operated approximately 100-300 years ago. Many of these beautiful pieces were once teapots, vases, urns, or cups. It's hard to authenticate each one, but I have a certain standard that I look for from a variety of sources. Depictions of birds, animals, or people, are rather unusual and are the ones that I am constantly seeking out. The shards are encased in a silver bezel which is comprised of a brass and silver alloy. This is an exception to my normal usage of .925 sterling silver, Bali silver, or gold filled components. The newest pieces that I have designed are made from a variety of semi-precious and precious gemstones. I buy the cleanest and best stones that I can afford. These designs are light, airy, and just plain sparkly! Tell me about your incredible bracelets. I have never seen anything like them. The bracelets are made from vintage cut steel. They actually look like little glistening marcasites. These were fashionable during the Victorian Era, 1837-1901. The Victorian Era was one of embellishment. These shoe clips or ornaments, were used to embellish a plain everyday shoe for a social evening out, rather than purchase many pairs of shoes. I have also used some beautiful French buckles and clips that were popular in the 1920's. Any advice or inspiration for someone starting their own line of jewelry? Make what you love as this comes from your heart.